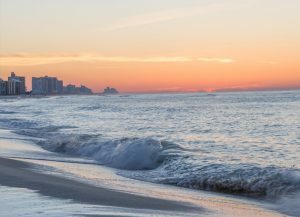 Communities throughout Alabama’s Coastal Connection will soon be celebrating Easter. You are invited to join in on the festivals, egg hunts, bunny appearances, sunrise services and more. Get your Easter baskets ready! These Gulf Coast venues are hosting some favorite Easter traditions: the Easter egg hunt and a chance to meet the Easter bunny! 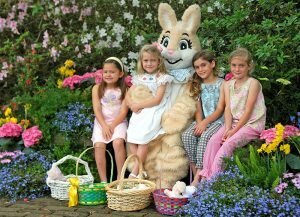 Bellingrath Gardens in Theodore provides family fun beginning at 8 a.m. on Saturday, April 13, when breakfast is served with a special guest: the Easter bunny. The egg hunt begins at 9:00, while craft projects, photos and more continue until noon. The Wharf in Orange Beach includes an egg hunt, face painting, bouncy house, pony rides and more during their holiday event on April 15 starting at 11:30 a.m.
LuLu’s in Gulf Shores will host their Easter Egg Dash at 1 p.m. on April 21, when kids can hunt eggs and get their photo taken with the bunny. The Hangout combines a buffet (7:30-11 a.m.) with a 9 a.m. Easter bunny meet-and-greet on April 21. It wouldn’t be Easter without an incredible service, and catching a sunrise service with a view is a bonus! The Flora-Bama is an understated and unexpected venue for a beachside Easter service. Join them at 6:30 for the sunrise service, or sleep in and attend a later service at 9 or 11 a.m.
Bellingrath Gardens is also hosting a 6:30 a.m. service on Easter Sunday. There is no admission fee to attend, and a hot breakfast will be available for purchase afterward.